Shifting dunes of shining white crystal rise from the Tularosa Basin at New Mexico's White Sands National Monument. Erosion from the surrounding mountains constantly replenishes the world's largest gypsum dune field, encompassing 275 square miles. During the day the dunes shine white against the blue sky. At sunset, the sands glow with the vibrant hues of twilight, while desert flora-yucca, cholla and rice grass-reach toward the last rays of the setting sun. 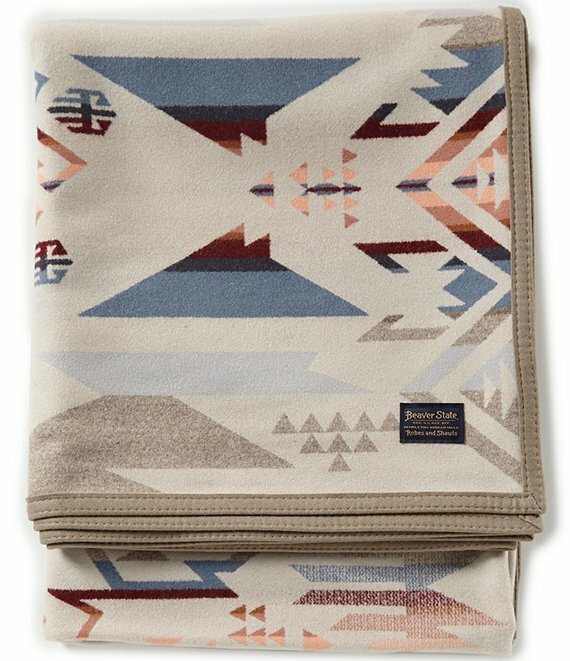 This design is Pendleton's homage to this striking and wild landscape.